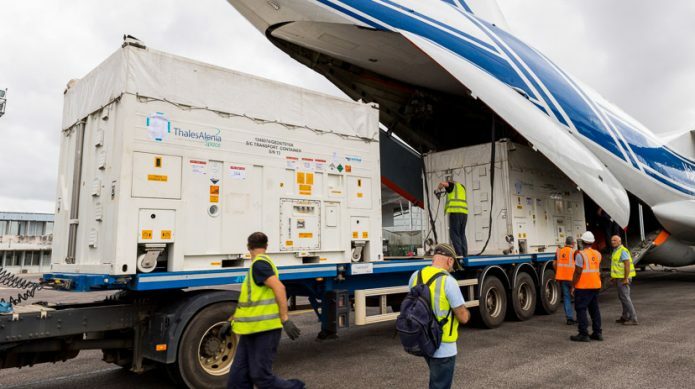 The latest batch of O3b satellites for launch by Arianespace are unloaded from a chartered IL-76 cargo aircraft at French Guiana’s Félix Eboué Airport. They will be orbited by a medium-lift Soyuz on Flight VS22. French Guiana has welcomed the four passengers for Arianespace’s second Soyuz mission in 2019, which will further expand the SES-owned O3b satellite constellation delivering low-latency, fiber-like connectivity to customers in more than 40 countries. This spacecraft quartet – built by Thales Alenia Space – arrived this week aboard a chartered cargo jetliner that landed at Félix Eboué Airport near the capital city of Cayenne, enabling them to be transferred by road to the Spaceport’s preparation facilities. The O3b fleet of medium-Earth orbit (MEO) satellites is a proven non-geostationary constellation that provides commercial broadband services today, delivering carrier-grade services. The first 16 spacecraft for O3b were successfully orbited by four Soyuz vehicles operating from the Guiana Space Center in 2013, 2014 and 2018. Each satellite weighs about 700 kg. at launch and provides more than 10 Gbps of capacity. This upcoming Soyuz mission is designated Flight VS22 in Arianespace’s launcher family numbering system, signifying the medium-lift workhorse’s 22nd liftoff from the Spaceport since its 2011 introduction at French Guiana. A high-resolution version of the above photo is available in the Gallery.